There is general agreement among anthropologists that Italians came out of Africa, along with the rest of us, including Inuit of the Arctic and Aboriginals of Australia. Not everyone, however, knows that Italy came out of Africa. Accompanying maps show the original location of Italy along with plausible origins of the Mediterranean islands. Atlases commonly depict the Adriatic Sea having opened up as Italy moved away from the former Yugoslavia. If this is correct then most of Europe was attached directly to Africa, before the Aegean impact. 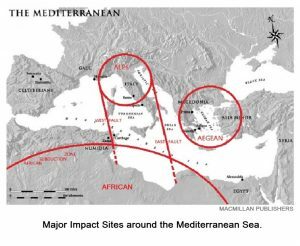 It appears that the Aegean impact was responsible for opening up the eastern Mediterranean Sea, but Italy and the Mediterranean islands still remained part of Africa after that event. Following another major impact, the Italian terrane bumped into Europe and the Alps began to form. As the terrane moved toward Europe, the islands broke away. The terrane which included Italy and the islands of the Mediterranean Sea does not fit nearly as well with the present shape of the Gulf of Sirte as the Greater Antilles fit the coastline of Central America (See: #3. Impact Geology). This is because the coastline along the Gulf has elevations that are close to sea level and the area has been subjected to the oceanic floods from at least two subsequent catastrophes since the departure of the terrane. The impact that most recently changed the geography of the Mediterranean Sea is the one marked by the curve of the famous Alps, which pass through France, Switzerland, Italy, and Austria, spilling over into Germany and Slovenia. Just as in the Caribbean, large islands were torn out of a mainland by mantle currents that were constrained between two parallel faults. Magma currents, generated from the large impact site, were deflected upward as they encountered a limb of the ancient African convection cell, but this time, things would be different. Instead of forming an island arc of active volcanos as the denser oceanic crust was subducted, lighter sialic rocks (rich in silica) rode up upon denser rocks at the impact site. They piled up by recurrent thrust faulting, older formations being deposited on top of younger ones as surging currents in the mantle carried the African terrane along to its destiny with Europe. 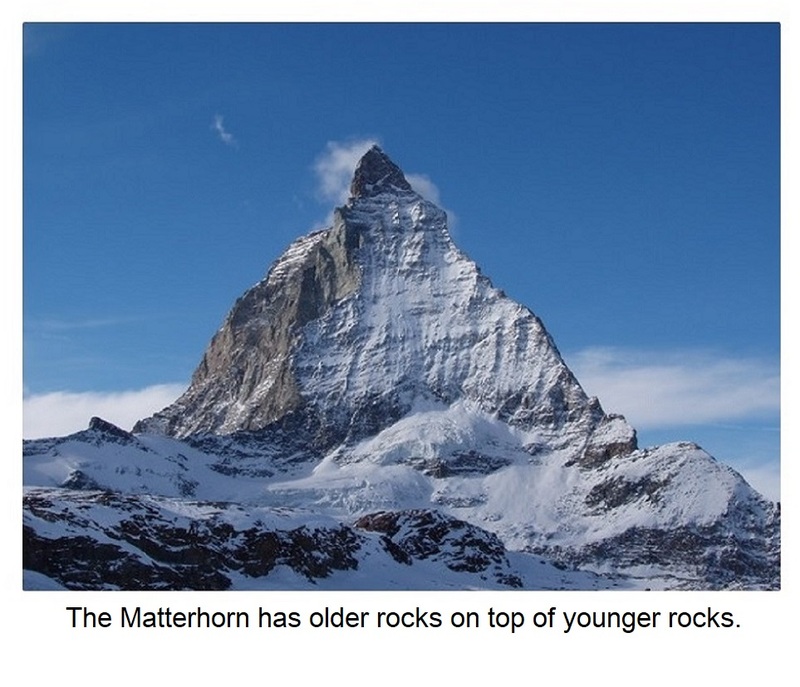 Mountain building continued until forces equalized between the advancement of the terrane and upward growth of the mountains. Mantle currents surging between two faults were directed toward the coast of Africa. After the Italian terrane was torn out of Africa it rotated clockwise 300 as it was moved north, finally docking against Europe along the course of the River Po. This river follows a deep fault which coincides with the western coast of the Gulf of Sirte (Gulf of Gabès), in present-day Tunisia. A convection cell beckoned, and thrust faults piled up layer upon layer to form a mountain range. 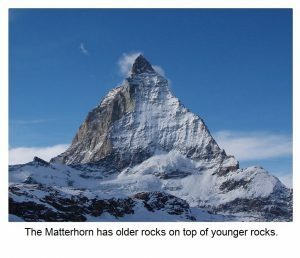 The best-known example of an inverted rock sequence in the Alps is the famous Matterhorn, where granite-gneiss at the peak of the mountain overlies younger, folded marine sediments. Geologists have positively identified the granite-gneiss as having come from Africa, and the marine sediments as originating along the African coast. This led to the conclusion that Africa is moving toward Europe. Although Africa is moving, ever so slowly, as revealed by extremely sensitive GPS measurements, it is also anchored to the mantle by the largest convection cell on Earth. The only parts of Africa that have moved significantly since the huge African impact have been the results of later impacts. The Aegean impact occurred long before the Alps formed. There, islands of a remarkably pure, white limestone that had accumulated slowly on the bottom of a sea, floated upon the lava pool. 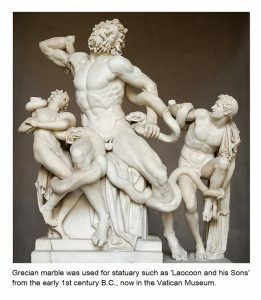 Heat from the lava metamorphosed the limestone into marble, providing material for the beautiful statuary of sophisticated civilizations that developed along the shores of the Aegean Sea. In comparing the Mediterranean to the Caribbean, there are striking similarities. Prior to the Venezuelan Basin impact, the Caribbean Sea had also been devoid of islands, and just as the Greater Antilles were torn out of Central America, Italy and the islands of the Mediterranean were torn out of Africa. One island, in particular, appears to have a remarkable story to tell. 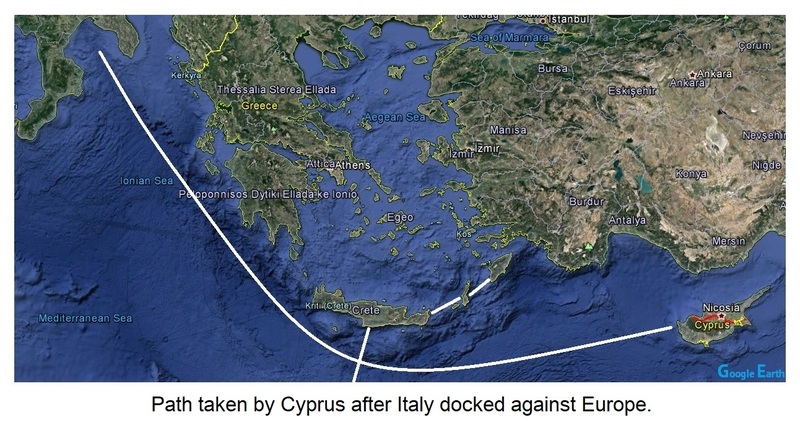 Cyprus nestled in the instep of the Italian boot, remaining there until the collision between Italy and Europe took place. 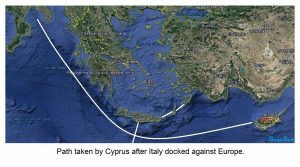 Cyprus then separated from Italy and was caught by mantle currents that took it on an astonishing journey, skirting the Aegean Sea and continuing to almost the very end of the eastern Mediterranean. Another island took a different course. 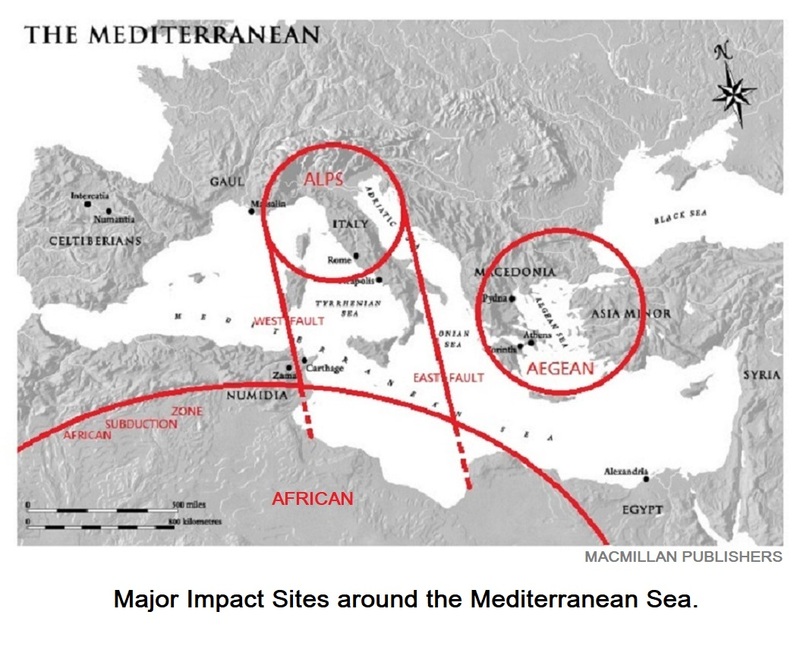 Crete, with a small piece of attached crust representing Rhodes, and the other Dodecanese Islands, left Africa to cross the narrowest part of the Mediterranean Sea, stopping at the edge of the Aegean impact site. Crete is the only crust removed from Africa by the impact that formed the Alps that lay outside of the two constraining faults. This may have been due to renewed mantle activity in the vicinity of the Aegean site. Around the world, islands have been torn out of continents by impacts and scattered about the seas. Islands are an indication of Earth’s internal energy level. Numerous islands at present mean that the internal energy level (temperature) of Earth is high. This is the legacy of many large asteroid impacts, and is in marked contrast to the reason for the high internal temperature of our neighboring planet, Venus (See: #10. Venus). Scientists continue to claim that the temperature of Earth’s interior is partly left over from the time of its formation, and partly the result of radioactive decay. The energy level could not, however, have decreased at the time of Pangaea when the continents were supposedly joined in a single landmass, and then increased again. The two major contributors to Earth’s interior energy level are asteroid impact and electromagnetic energy derived from the Sun and the Galaxy. Radioactive decay would be a minor contributor. This is an example of how Science establishes a claim, and then stubbornly holds onto it until it is replaced by something else. (See: #16. Cosmology 1). A question that should be asked when considering islands and terranes that have departed a mainland is: What is the source of the energy that prompted them to move? Cuba didn’t suddenly leave Central America just because it had been there long enough, and Italy didn’t tear itself out of Africa for no good reason. I have explained the process as it applies to the Caribbean and Mediterranean, and a comparable process must apply to similar examples around the world. 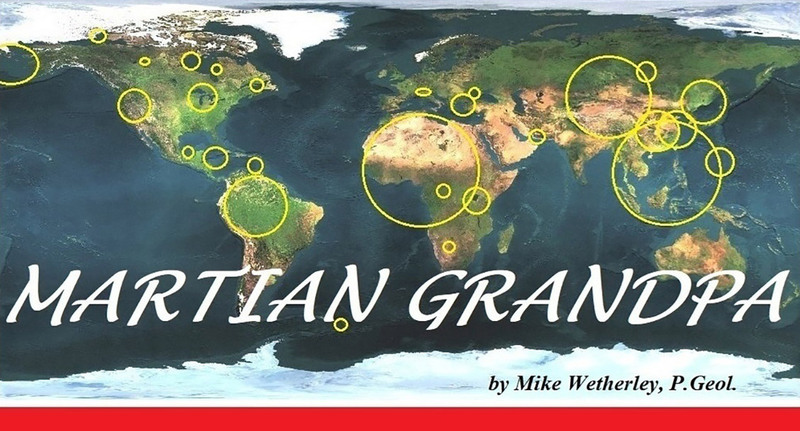 Some terranes were huge, such as the sub-continent of India, and some traveled great distances across oceans, as did parts of the west coast of North American which are inferred to have traveled across the Pacific from south-east Asia following the giant Indonesian impact. In the Caribbean, the South Shetlands, and throughout the Pacific, island arcs generate arcuate chains of volcanos. What they all have in common is a large impact upon oceanic crust that is moving away from a mid-ocean ridge. The impact results in a convection cell consisting of lava that is less dense than the crust that is moving toward it. (Again, liquid rock is less dense than solid rock of the same type.) Two faults are generated from the impact site, delimiting the crust that is subducted. If the crust were not moving, the impact site would solidify and leave little evidence, but with the movement of crust away from the mid-ocean ridge, subduction causes volcanos to form and an island arc results. Another factor is the sudden jolt of the impact that releases pent-up energy in an instant, likely increasing the rate of advance from the mid-ocean ridge to establish the subduction process. The plunging lithosphere takes seawater with it, reducing the melting temperature of the rock and as steam, assists lava to work its way to the surface. Volcanism will continue along the arc as long as crust continues to move away from the mid-ocean ridge, and may increase its movement violently from time to time in response to later impacts. This is not the same process that took place in the Mediterranean. Although two major faults were generated toward a subduction zone, other conditions were different, and they resulted in a distinctly different outcome. Of all published accounts of Earth’s geographic poles changing their positions, and there are many, one that caught my attention was by Charles Hapgood, who was a history professor at Keene College in New Hampshire, and who died in 1982. He promoted a concept of Earth’s geographic poles shifting as a result of ice building up in the Polar Regions. Although I do not accept this claim, the two most recent geographic pole positions that he identified were close to my own. Moreover, he claimed a third most recent pole location, which I had been unable to determine. I had searched the globe (a model globe) for evidence of the third most recent North Geographic Pole position without success, although I recognized several impact sites that might have been responsible. There was something else I knew, and this was that a catastrophic event of some kind, probably the 3rd most recent major impact, had occurred roughly 150,000 years ago. The evidence for this comes from a sudden and large change in atmospheric dust recorded in an ice core from the Vostok hole in East Antarctica. 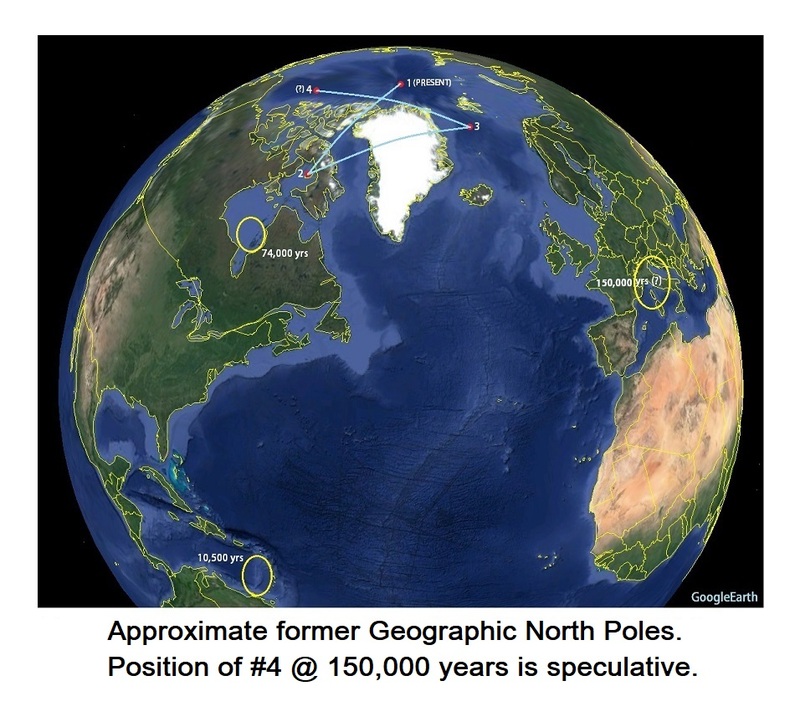 Similar evidence from ice cores supports the two more recent axis changes as well, which took place about 10,500 and 74,000 years ago. I lined up Hapgood’s 2nd most recent and 3rd (adjusted) North Geographic Poles, with a length of string held against a globe. Continuing along what would have been the meridian of maximum axis change, and allowing for a reasonable change in longitude as the axis change occurred, the Alps offered a plausible fit. This is a site that I had been considering as the cause of the 150,000 years BP (before present) impact, but I lacked proof. While I could not accept the precise position of Hapgood’s 3rd most recent North Pole, the coincidence had my attention. I recently encountered a video on the internet which demonstrated how a former Yukon site for the North Geographic Pole was calculated by selecting two intersecting meridians from an equator which passed through the ruins of several ancient sites such as Angkor Wat, Machu Picchu, etc. This is nonsense for the timeline involved since all of the sites were built much later than even the most recent major axis change, which occurred about 10,500 years ago, and Hapgood was definitely not influenced by this silliness. Even so, I was curious about how he arrived at his 3rd most recent location of the geographic North Pole. 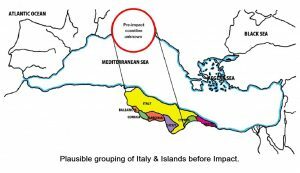 If the impact site responsible for The Alps formed 150,000 years ago the geological implications are considerable, for this impact appears to have been the one responsible for tearing Italy away from Africa, along with every island in the Mediterranean Sea. Soon after that, Italy docked against Europe along the present course of the River Po, the Alps began to form, and Cyprus began the final leg of its epic journey. In case this sounds unlikely to some, I have offered credible proof that the Greater Antilles broke away from Central America about 10,500 years ago, and that is only 7.5 % as long ago. It isn’t catastrophism that’s wrong, but catastrophism continues to be opposed by people who were taught one thing and now have difficulty in accepting something new. Whatever catastrophe took place 150,000 years ago, I believe that the most likely cause is the impact that produced The Alps. Before I began my quest I might not have accepted claims for the age of the two most recent axis changes either. That evidence, however, is unassailable. There will be many skeptics, of course, and even deniers, at first. I hope, however, that most will allow themselves to consider the evidence. With two major impacts resulting in axis change occurring within the past 74,000 years and, I suggest, three within the past 150,000 years, we can begin to regard our physical world in a whole new way. The ages of the two most recent impacts can be readily determined, and for the most recent, in the Caribbean, definitive samples have already been collected and have already been age dated. Regrettably, these results have been kept hidden, and I am calling upon the United States Geological Survey to arrange to have sample-date results released to the public. Allan O. Kelly may have been one of the first to recognize the great array of sizes of impact structures, from hand specimens to entire mountain ranges. Granite, and especially granodiorite (the two rock types differ in their composition largely by the ratio of their feldspars) often display spires and shatter cones in the mountains surrounding an impact site. Kelly believed that these huge structures formed when granitic rocks were deeply buried, and this controlled their erosional forms upon subsequent exposure at the surface. Some of the best small-scale shatter cones have been formed in fine-grained sediments such as limestone and clay. Back in 1972, Kelly submitted a paper to a scientific journal for publication, entitled ‘The Gigantic Cone Structures of the Sierra Nevada.’ Naturally, it was rejected. 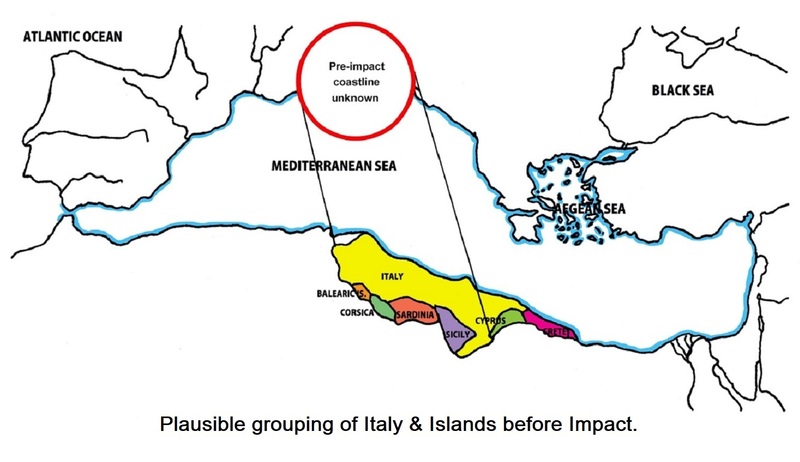 A date for the movement of the Italian terrane might be determined by drilling through present sediments to reach underlying volcanic rocks in the track left by Italy as it departed Africa, and behind the islands of Sicily and Sardinia, as they departed Italy. 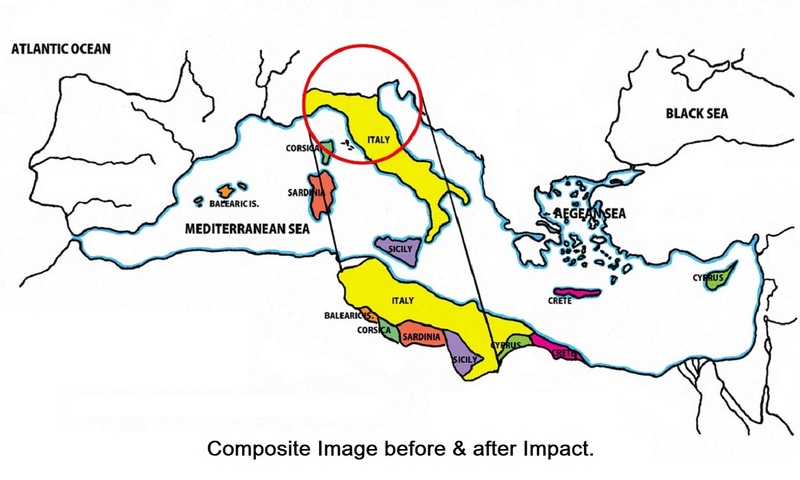 Deeper Mediterranean basins such as the Tyrrhenian Sea (north of Sicily), and the Ionian Basin (south-east of Sicily), may offer good opportunities for obtaining cores for age dating. Not many scientists would have anticipated an age of 10,500 years for the Caribbean Sea, and just as few, most likely, an age of 74,000 years for the Hudson Bay Arc. 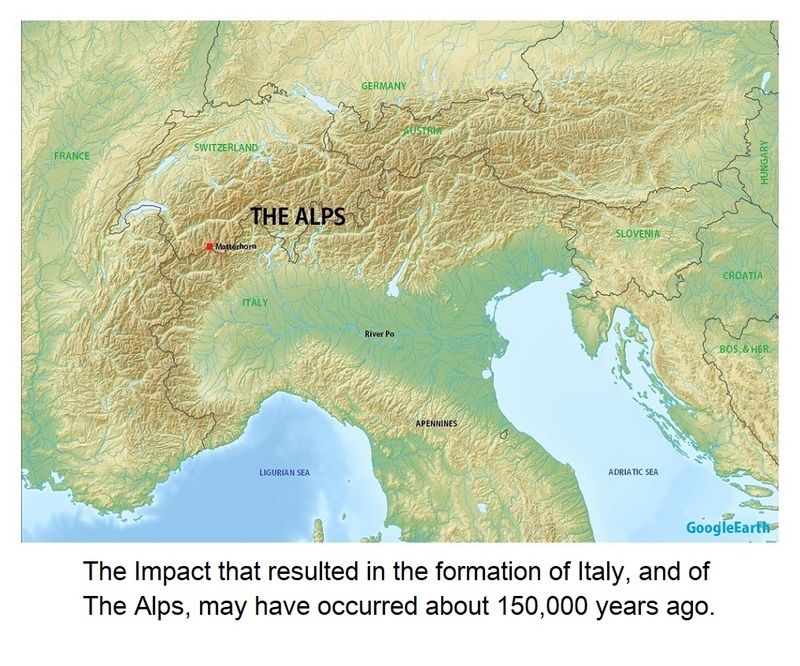 How few will fail to be surprised should an age of about 150,000 years be confirmed for the impact site that led to the present site of Italy, and the formation of the Alps? Donations to permit me to continue my work will be helpful as I have invested a sizable sum over the years. To contribute, please click the Donate Button below. Even a couple of dollars will help!